It’s 5:30 am and I am unable to decode what she just said. Decode successful…. JesusChristGodAlmighty!!! My blood goes to instant boil, but because my daughter has told me many times over the years that I have a tendency to overreact, I keep my mouth shut and let her tell the story. Her roommate woke to find a man standing over the bed. She screamed. Fortunately, the man ran out of the house. They called the police who came and took a report. The police just left. I’m shaking and want to throw up. I want to go on a verbal rampage of disgust and horror, a tirade about how young women are prey in our society. Instead, I ask my daughter if she’s okay. She’s emotionally shaken and will take the day off work, but she’s physically unharmed. I express gratitude for her safety and praise for the way she handled the situation. I invite her to call whenever she needs me. I tell her I love her. My 23-year old daugh ter is capable of taking care of herself. But this doesn’t stop me from wanting to grab a shotgun, jump in the car, drive the eight hours to her house, sit on her front porch every night, and shoot anyone who walks by. How does Gary handle this news? Over the decades, we’ve developed into quite the yin and yang. Whenever I’m a raging maniac, he stays calm, and vice versa. He points out the positives of the ordeal: no one was physically harmed, the police are investigating, blah, blah, blah…. Shut the hell up. Where’s the shotgun? I do not believe that women need to be coupled with men for protection. 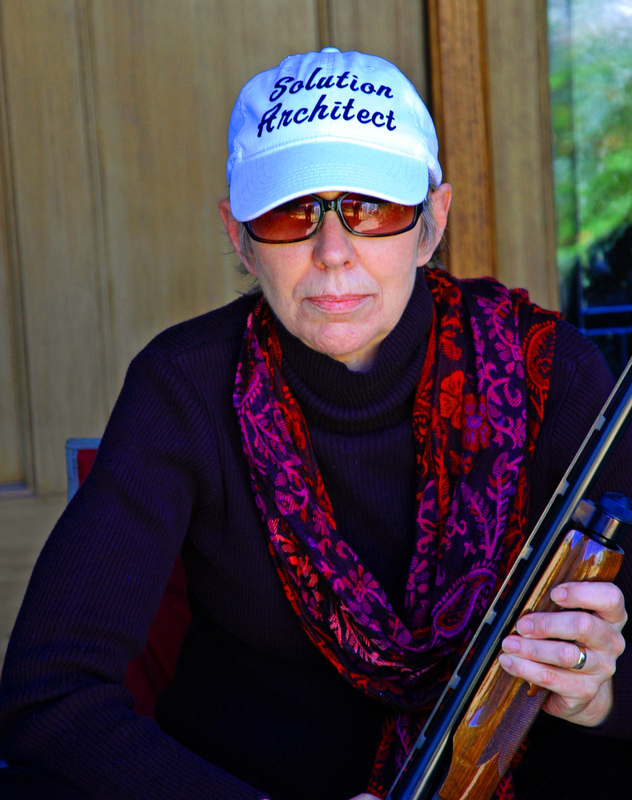 I was exposed to the women’s lib movement in the ‘70s and went so far as to keep my maiden name when married at the age of 21. Over the next 25 years, I was so radical that I cooked, cleaned, did laundry and grocery shopping while also engaged in full time employment. It wasn’t until I was too tired to continue that I stopped doing nearly all domestic chores. In my defense, women’s lib did little to restructure the early imprinting my tender mind received in the ‘50’s and ‘60’s. Men worked and made money to support the household. Their only domestic requirement was to mow the lawn on Saturdays. That is, until their sons grew old enough to run the lawn mower, releasing Dad to his uninterrupted weekend beer fest, while Mom cooked, cleaned, did laundry, grocery shopping, and made sure the kids were raised before divorcing Dad. I want my daughter to be strong and independent. I hope she eventually finds a mate she loves and respects and who loves and respects her in return. I want her to pair with someone who will share the weight of what it means to run a household. In the meantime, I want her to be safe from sick bastards who feel entitled to walk into her house under the cover of darkness. When living with a 20-something, sexually frustrated female becomes too burdensome, we will ship them off to boarding houses run by nuns. Residents will be required to check in and out. Weekday curfew will be 10pm; midnight on weekends. No alcohol or drugs allowed. 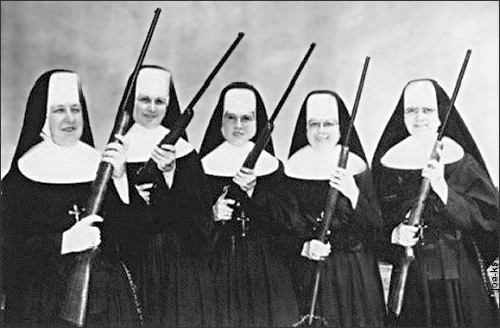 The nuns will be trained in the military style of sharpshooting and will pack guns at all times. It doesn’t matter if the girls like it. Parents and nuns will love it.